It's a rare occasion, it seems, for a rider to retire at the height of his or her powers. In the case of 36 year old, Koos Moerenhout, the tall Dutchman seems to be performing better than ever in 2010, and yet, Sunday's World Championships road race was his final as a professional. The rider, who first rode as a stagiaire for Motorola in 1994, has put together a sterling record this season highlighted by victory in the arduous third stage of the Eneco Tour and, eventually, 2nd overall behind a dominant Tony Martin. Along with a great effort at the Eneco Tour, Moerenhout has cashed in on ten assorted top ten's throughout the season, underlined by 6th place at the Tour de France's long time trial, 6th in the World Championship time trial, 2nd in the Tour of Belgium time trial, 2nd in the Dutch National time trial, and 4th in the Dutch National road race. Never before has the experienced Dutchman managed such consistent results. Moerenhout has achieved some bigger wins in the past, namely two road national championships in 2007 and 2009, the overall at the Circuit Franco-Belge in 1996, along with stages in the Tour of the Basque Country and the Tour of Austria. Amongst all of this success, Moerenhout is still adamant in finishing his career. The time trial specialist himself only realized the gravity of his commitment on the final lap on Sunday. "It was only when we were on the last lap, that it really dawned on me that my career would be over in about 20 minutes. Then, I spotted soigneur Sjef van Engelen, who was ready at the roadside. He stood there for me as well, when I did my first Junior World Championships, 21 years ago. Well, I thought: the circle is complete," commented the exiting rider on feltet.dk. Even with his advancing years, Moerenhout managed to take a noteworthy 13th on the day, putting him as the best placed Dutchman in Geelong. Moerenhout was active in the finale and managed to place himself in the high-powered break that threatened to go all the way to the finish line. Showing his colors as the faithful team worker he has been his whole career, Moerenhout preferred to look at the Dutch team rather than his own excellent ride. "First and foremost, I was glad that it was a really great team effort. It has been a very long time since we've raced so well as a national team. There was a really good team spirit, and it is good for Dutch cycling." On Twitter, Moerenhout was just as effusive with his praise: "Happy to have done a great race with a great Dutch team. Thanks everybody for the nice reactions…By the way: great atmosphere around the circuit. Thanks, Australia." 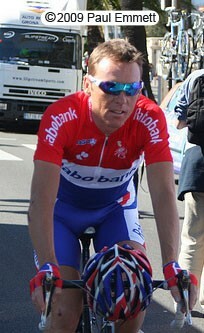 Moerenhout's tireless riding will be sorely missed by the Rabobank team in 2011.